This project consisted of Landscaping the marketing suite and the car parking area, also four open plan rear gardens and the fronts too. I thought that now 8 months down the line you might like to see how the gardens have become established. I also want to show the high standard that we keep our gardens maintained. If you refer to the previous blog for Chard in October 2013, it is will serve as a reminder as to the work carried out and the elements we were battling against. These photo's show how healthy the gardens look and how well established the plants are. The sunshine helps to show off all the features that were built into these gardens. these included paved and cobbled patio areas, raised beds decked areas with pergolas and not forgetting the living parasol. The different areas were linked by pathways.These were created using various materials from chipped bark to golden gravel, the raised beds and planted areas were dressed with either chipped bark or plum slate to give the finishing touch. 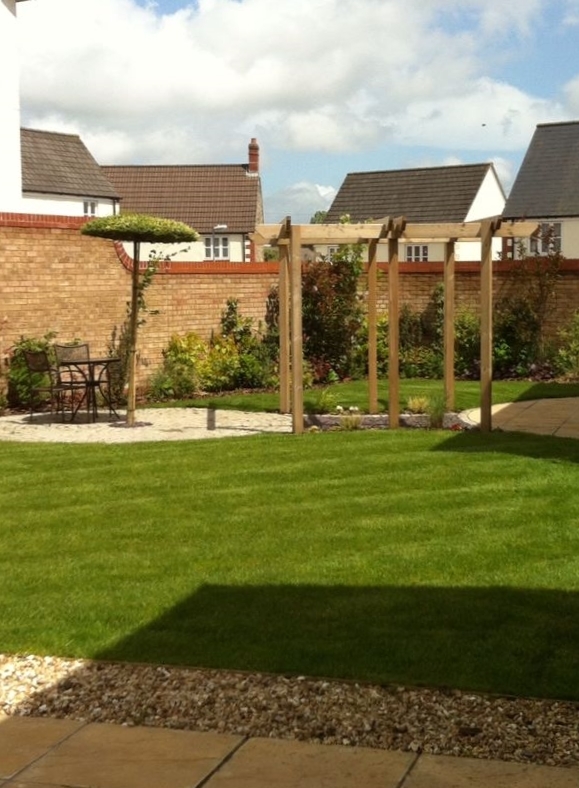 These pictures show some of the frontages and open spaces which were laid with good quality turf, plants and trees. As you can see these areas are kept well maintained with the grass regularly watered and mowed to keep it looking its best. I hope you will agree that these gardens are of a very high standard. We endeavour to ensure that they are kept that way at all times with a regular maintenance programme.